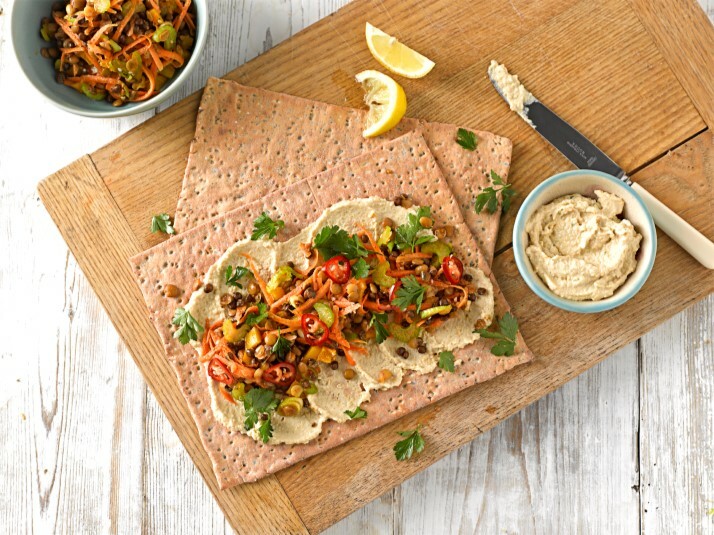 Our team of expert Warburtons bakers have created new Protein Wraps with a blend of flavoursome seeds (chia, quinoa, millet and linseed). Available now in Asda and Morrisons, our new wraps contain 11g of protein each and are high in fibre and low in saturated fat too! Protein is a nutrient found in food that is a necessary part of the diet, it contributes to the growth of muscle mass and maintenance of normal bones. There are many reasons why people increase their protein intake depending upon individual circumstance, for example athletes need more protein throughout the day for muscle growth and repair*. We would always recommend speaking to a qualified professional when considering changing your diet. To create our high protein wraps, we use a blend of plant based protein (pea protein) and seeds high in protein to deliver 11g of protein per wrap. For comparison, a typical medium egg contains 6g of protein. If you’re looking for high protein fillings, turkey or chicken breast, tuna, cottage cheese and beans such as chickpeas or black beans are all considered to be high in protein – check the nutritional information on pack. Our Protein Wraps are available in a pack of 4, with a recommended retail price of £2.99. The products are available in Asda and Morrisons, visit our store locator and select Protein Wraps to find your nearest stockist. Try our Rainbow Salad Protein Wrap recipe here. What is the ratio of protein to carbohydrates? Each gluten free protein wrap contains 11g of protein and 22.1g of carbohydrates, full product details, including ingredients and nutritional information, can be found here. Pea protein is a vegetarian source of protein which has been extracted from the yellow pea. Does this wrap contain egg? Whilst egg is not an ingredient, this product is made in a bakery that uses egg. Does this wrap contain yeast? No, this product does not contain yeast.